No tricks. No gimmicks. No plan. Just an hour in my company as we reach the end. Things will be over soon. We're nearly there everyone! Great work. But before we go, I'm making one last attempt to find connection in the here and now, to snuffle out any remaining joy in this rapidly crumbling world, before it's too late. Edinburgh Comedy Award nominee 2017. Chortle Comedian's Comedian Award winner 2018. 'Majestic and challenging' ***** (List). 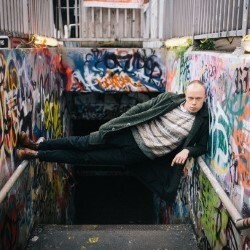 'Impressively brutal and self-lacerating physical comedy' ***** (Skinny). 'Digressive, deeply unsettling and very funny' **** (Guardian).